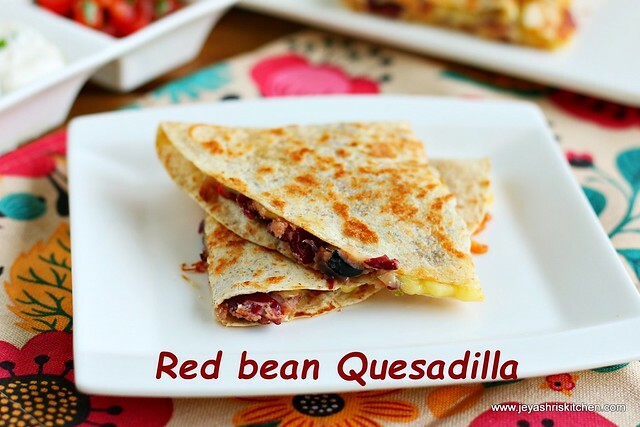 Red bean quesadilla, i wanted to post for a long time. This can be made with store bought tortilla or home made tortillas. We have tasted this quesadilla many times in Myras beach club here in Singapore. This is the first time i am trying red bean quesadilla at home and they turned out very well. I have done a similar filling for making a wrap, when i did a cookery show in London, in June. This can be made with left over chapathis too. 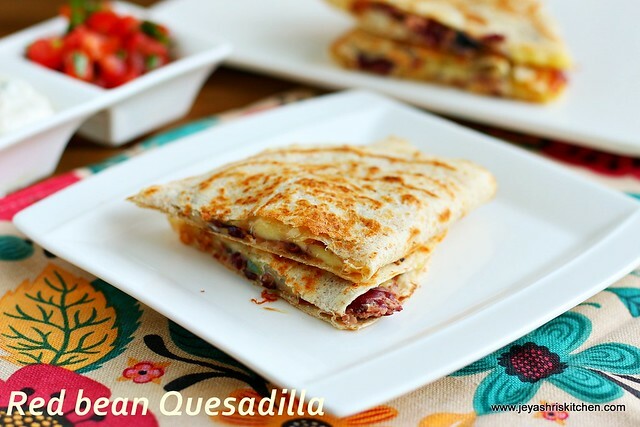 Try out this easy quesadilla recipe for kids lunch box or evening snack time. Check out my tortilla pizza and jacket potato recipe. If using dried red kidney bean (rajma) soak it in water for 12 hours and pressure cook till 5-6 whistles with little salt. Drain the water and keep it ready. I used canned red kidney bean. Finely chop the onions, garlic and bell pepper. In a pan add oil and add the finely chopped garlic. Cook this for few seconds. Add the onions and cook till they become translucent. Add the chopped bell pepper and cook for a minute. Add the olives. I used the sliced ones. Add in the oregano, red chili and salt. Add the red kidney beans to this. Mix well and cook for a minute and put off the flame. Using a potato masher, mash the red kidney beans gently. Filling for quesadilla is ready. Let this become warm. Place the tortilla on a tawa greased with little butter. I used store bought tortilla. Cook on both sides for 5 seconds. Spread 2 tblsp of cheese on one side of the tortilla. Adding cheese in the beginning is optional. I want it to be more cheesy so added it. Now place some red bean filling on the top of the cheese. Add some more cheese on this. This portion of cheese is a must for the quesadilla. So do not skip this. Cover the cheesy portion with the empty side. Refer video for this, in case if you have doubt. Cook on both sides. Once the cheese melts it will stick to the top and will get the tortilla sealed. Take it out from the pan and cut this into 2 to make a triangle shape. Quesadillas are ready to serve. Serve hot with sour cream dip and tomato salsa. Instead of red kidney bean you can use black bean too. Adding olives is optional but it gives nice taste to the quesadillas. You can add few veggies like mushroom,corn, zucchini, carrots, cabbage to this red bean mixture. You can use home made tortilla or left over chapathis can also be used. Instead of keeping the stuffing on one side you can spread it on the tortilla and place one more tortilla on the top and cook. Since i used store bought tortillas and they are bit big, i am bit scared to flip it while cooking, so adapted this easy method. Can you tell me what cheese we should use?